Goderich is located in Huron County, along the shores of beautiful Lake Huron. Goderich is known as Canada’s Prettiest Little Town. With a population of just 7,500, it’s a very quaint place to visit. But it’s beauty is second to none. Our injury lawyers are big fans of this little town. If you ever have a case in Goderich., we’d be pleased to come out there, free of charge. No joke! The gorgeous scenery would be our reward. You can’t take a trip to Goderich without visiting the giant town square, which is smack dab in the middle of their downtown core. It seems that all roads in Goderich lead to the square, because in reality, they do! There is an octagonal traffic square. In the middle of the square is some beautiful green space, and in the middle of that is the Huron County Courthouse. This is the Courthouse which serves all of the car accident, brain injury, catastrophic injury, slip and fall, and other personal injury cases in Huron County. To say that the square, and the Courthouse in the middle of the square are picturesque is an understatement. This Courthouse isn’t just famous for its scenery. It has also been the site of many high profile legal cases in Canadian History. The Steven Truscott Murder Trial was held at this Courthouse. A number of other civil proceedings for the Goderich area and Huron County are also heard here, although they don’t have the same high profile media stature as the Truscott Trial. Our law firm can’t talk about Goderich without making reference to the horrific tornado which devastated the Town on August 21, 2011. The tornado picked up strength across Lake Huron, and travelled directly through the town causing millions of dollars in property damage. Buildings were destroyed, telephone and power line came crashing down, streets flooded. Nearly 40 people were injured, and one person, Norman Laberge died as a result of the tornado. It wasn’t pretty. 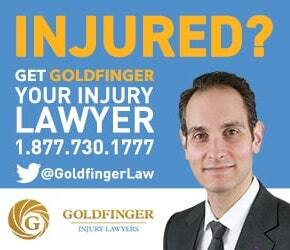 Goldfinger Law assisted residents of Goderich with their property damage claims in relation to the tornado. There weren’t any significant personal injury claims to report because this was an unforeseen natural disaster. You can’t sue mother nature for this sort of thing. If you’re ever hurt or injured in a car accident in or around the Goderich area, you will likely be treated at the Alexandria Marine & General Hospital, which services the community at large in Huron County. Our law firm has visited clients at the Alexandrian Marine & General Hospital following their accidents. We have also retained doctors from the hospital to assist our office and our clients in preparing medico-legal reports and functional ability evaluations. The cost of these reports is not covered by OHIP. We don’t expect our clients to pay for the cost of these reports because they can be very expensive, and we know that following a bad accident, our clients don’t have the means to pay for the cost because they’re not working. Not to worry. We will pick up the tab for these medico legal reports because we know that they will help with the progression of your accident case. It’s a risk we’re happy to take because it’s what we do.